Built to withstand commercial applications, the PZT54 features a rugged 5x7.5cm steel tube style frame for outstanding structural strength and heavy-duty front caster assemblies with tapered roller bearings on wheels and pivots to ensure longevity. The 54” side-discharge fabricated cutting deck is constructed from twin 10-gauge steel sheet construction which equates to a 1/4” thick top deck area for added structure and spindle support. Cast aluminum blade spindles feature tapered roller bearing construction for increased service life and the top idler system ensures extended belt life. The cutting deck also includes heavy-duty scalp roller mounts and a rubber discharge shield. To meet the reliability and performance expectation of the ground drive system, the new PZT54 utilises commercial-grade, integrated ZT3400 transmissions with 12cc pumps. This allows for smooth operation, speeds of up to 16km/hr and reduced risk of hose and fitting leaks. The integrated design also creates a cleaner and wider open area under the seat, improving access to service points. From the comfort side, the PZT54 has been designed with careful control placement, ergonomic adjustable steering levers and a fully adjustable seat, to allow the unit to be tailored for any user. The Roll Over Protection System (ROPS) comes as standard equipment, increasing operator safety and has the added benefit of a folding design to allow easy access under low hanging branches and simple transportation. 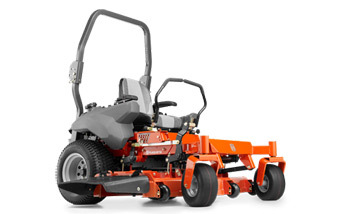 The PZT54 offers a more compact commercial mowing solution for smaller areas, with the same high quality, professional features you expect from Husqvarna.